HOUDINI offers sugar-coated schmaltz about the great magician in a pleasant entertainment that won’t tax your brain any, but might divert you from your worries for 106 minutes. Good one for kids. 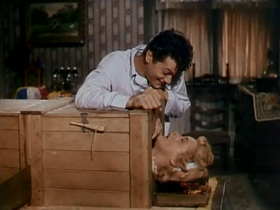 Nothing substantial about the real Harry Houdini in this 1953 outing, directed by George Marshall; just your basic boy-meets-girl pastiche with tricks and feats to flavor the domestic fluff. 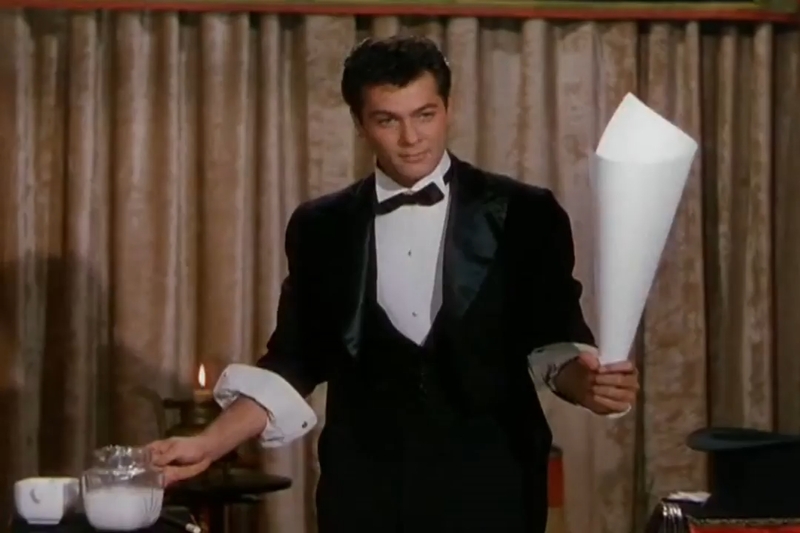 Since Tony Curtis and Janet Leigh were both on the rise and had just married each other, it seemed like a neat idea to offer America a wholesome couple to gush over, and this was their first of six pictures together. He makes a snappy trickster, even if the portrayal is at comic-book depth. Tony was 28, Janet 26—look out Photoplay, here we come! The color is pretty, the pace is reasonably fast, some of the escapes and stunts will give you a smile. The neatest is Houdini’s dramatic submersion under an ice floe. Fluff came in 53rd place for ’53, grossing $5,500,000. With Torin Thatcher, Angela Clarke, Ian Wolfe, Connie Gilchrist, Sig Rumann and Michael Pate.